Getting around Nice is a lot easier now that the Tram has been completed -- Cost 1 Euro. There are ticket machines at every stop making this an easy way to travel. Promenade des Anglais ("Walk of the English") is a celebrated promenade along the Mediterranean at Nice, France. Before Nice was urbanized, the coast at Nice was just bordered by a deserted band of beach covered by large pebbles. The first houses were located on higher ground well away from the sea. Starting in the second half of the 18th century, the English took to spending the winter in Nice, enjoying the panorama along the coast. When a particularly harsh winter up north brought an influx of beggars to Nice, some of the rich Englishmen proposed a useful project for them: the construction of walkway (chemin de promenade) along the sea. 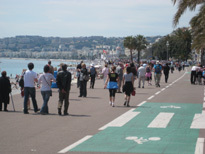 The city of Nice, intrigued by the prospect of a pleasant promenade, greatly increased the scope of the work. The Promenade was first called the Camin dei Anglais (the English Way) by the Nicois in their native dialect Nissart. After the annexation of Nice by France in 1860 it was rechristened La Promenade des Anglais, replacing the former Nissart name with its French translation. The Hotel Negresco on the Promenade des Anglais on the Baie des Anges in Nice, France was named for Henri Negresco (1868-1920) who had the palatial hotel constructed in 1912. In keeping with the conventions of the times, when the Negresco first opened in 1913 its front opened on the side opposite the Mediterranean. 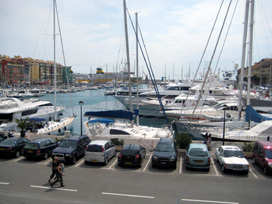 The port of Nice is also known as Lympia port. This name comes from the Lympia source which fed a small lake in a marshy zone where in 1745 work of the port was started. It constitutes today the principal harbour installation of Nice - there is also a small port in the Carras district. The port of Nice is the first port cement manufacturer of France in connection with the treatment plants of the rollers of the valley of Paillon. Ferries frequently leave the Port of Nice to Corsica. Fishing activities remain but the number of professional fishermen is now lower than 10. 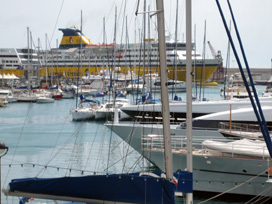 Nice, being the point of continental France nearest to Corsica, has ferry connections with the island developed with the arrival of NGV or navires at high speed. Two companies ensure the connections: SNCM, a partially public company and Corsica Ferries - Sardinia Ferries, an entirely private company. Located in front of the port, the place Cassini was renamed place of Corsica. Like any Mediterranean city, the town of Nice has squares; allowing people to gather, to organize great shows, performances or public display, or just to sit down at a terrace. 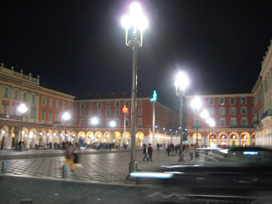 The Place Massena is the main square of the city. Before the covering of the Paillon River, the Pont-Neuf was the only practicable path between the old town and the modern one. The square was thus divided into two parts (North and South) in 1824. 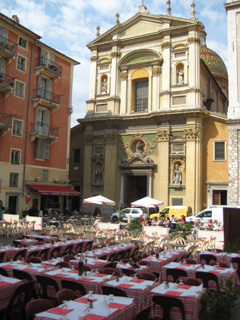 Since the destruction of the Massena Casino in 1979, the Place Massena became more spacious and less dense and is now bordered by red ochre buildings of Italian architecture. 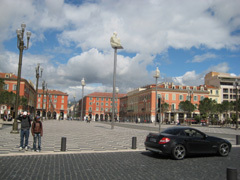 Place Massena is the main square of the city. The recent re-building of the tram gave the square back to the pedestrians, restoring its status of a real Mediterranean square. It is lined with palm trees and stone pines, instead of being the rectangular roundabout of sorts it had become over the years. Since its construction, the Place Massena has always been the spot for great public events. It is used for concerts, and particularly during the summer festivals, the Corso carnavalesque (carnival parade) in February, the military procession of July 14th (Bastille Day) or other traditional celebrations and banquets. The Place Massena is a two-minute walk from Promenade des Anglais, old town, town centre, and Albert I Garden (Jardin Albert Ier). It is also a large crossroads between several of the main streets of the city: avenue Jean Medecin, avenue Felix Faure, boulevard Jean Jaures, avenue de Verdun and rue Gioffredo. The Place Garibaldi also stands out for its architecture and history. It is named after Giuseppe Garibaldi, hero of the Italian unification (born in Nice, which was still a part of Sardinia-Piedmont at the time), who was ferociously attached to the union of Nice to Italy. 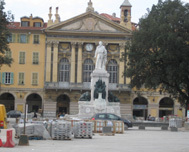 A Statue of Garibaldi is erected in the centre of the place. The re-building of the square (still ongoing) will make this square semi-pedestrian, making it more pleasant. Statue of Garibaldi. The place as of April 2008 was still being renovated. 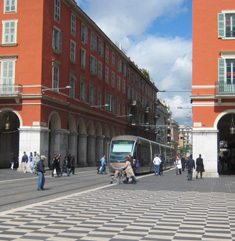 It is a crossroads between the Vieux Nice (old town) and town centre. 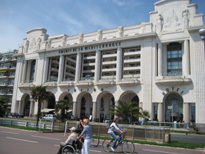 Place Garibaldi is close to the eastern districts of Nice, Port Lympia (Lympia Harbor), and the TNL commercial centre. This square is also a crossroads of important streets : the boulevard Jean Jaurès, the avenue de la république, the rue Cassini and the rue Catherine Ségurane. Entirely enclosed and pedestrianised, this square is located in the heart of the old town. With typical buildings in red and yellow ochres surrounding the square, the cathédrale Sainte-Réparateand the fountain in the centre, place Rossetti is a must-see spot in the old town. By day, the place is invaded by the terraces of traditional restaurants and the finest ice-cream makers. By night, the environment changes radically, with tourists and youths flocking to the square, where music reverberates on the walls of the small square. In the past, it belonged to the upper classes. It probably is the most traditional square of the town, with its daily flower market. The court Saleya also opens on the Palais des rois Sard (Palace of the Kings of Sardinia). In the present, the court is mostly a place of entertainment. There are good restaurants serving typical Nicois cuisine, markets and many pubs. It is no doubt one of the most active spots in Nice. It is situated parallel to the Quai des Etats-Unis. 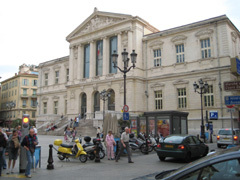 As its name indicates, the place du palais is where the Palais de Justice (Law courts) of Nice is located. On this square, there also is the Palais Rusca, which also belongs to the justice department (home of the tribunal de grande instance). The square is also notable due to the presence of the city clock. Nowadays, the Place du Palais is alive day and night. It is particularly appreciated by youths who hangout on the steps leading to the Palais de justice, often with alcoholic bottles in hand. The place is not a large open-air bar, though, concerts, animations and events are frequent. It is situated halfway between cour Saleya and place Massena. Eglise Gesu located on rue Droite, is a Baroque treasure nestled peacefully in the quiet place du Gesu. 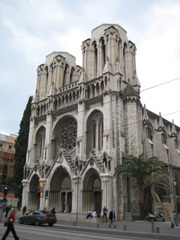 The petit Eglise du Gesu is one of the oldest parishes in Nice. It was inspired by a Roman church but built in 1642 by a Niçois architect. The Observatoire de Nice (Nice Observatory) is located on the summit of Mont Gros. The observatory was initiated in 1879 by the banker Raphael Bischoffsheim. The architect was Charles Garnier, and Gustave Eiffel designed the main dome. The 76-cm (30-inch) refractor telescope that became operational in 1888 was at that time the world's largest telescope. It was outperformed one year later by the 36-inch (91-cm) refractor at the Lick Observatory. As a scientific institution, the Nice Observatory no longer exists. It was merged with CERGA in 1988 to form the Observatoire de la CÃ´te d'Azur. The Chateau -- "Colline du Chateau"
Just about everyone that visits Nice climbs the steps of the "Colline du Chateau" up to the top, which offers fabulous views over the Baie des Anges, Old Nice ,and the Port. On the hilltop where the ancient castle stood, is an attractive park with wonderful green fields, shadowy lanes and some restaurants and café's. The hilltop is situated between two historical and attractive parts of Nice: the old town and the harbour quarter. You will get some of the finest panoramic views in Europe here . It is easily accessible from the foot of the Old town and the bay, but for those not able to make the climb there is a lift - an "ascenseur". There are 213 steps from the bottom to the observation platform on top of the Naval Museum, and then more steps and various walkways on to the top. The Chataeu can be seen from the Promenade Anglais walking toware the port. Nice is one of the oldest human settlements in the world. Terra-Amata, an archaeological site dating to the Lower Palaeolithic age is situated near Nice. Nice was established by the ancient Greeks. There was also an independent Roman city near Nice, where the hill of Cimiez is located. It is an archaeological site with treasures, of which only a small part has been excavated. The excavated site includes thermal baths, arenas and Roman road. Since the second century AD, the light of the city has attracted many famous painters such as Chagall, Matisse, Niki de Saint Phalle, Ben and Arman and inspired many artists and intellectuals in different countries (Berlioz, Nietzsche, Rossini). Nice also has numerous museums of all kinds: Musée Chagall, Musée Matisse (arenas of Cimiez where one can also see Roman ruins), Musée des Beaux-Arts Jules Chéret, Museum of Naïve arts, Musée Terra-Amata, Museum of Asian Art, Museum of Modern art and Contemporary art which devotes a broad place to famous “the Ecole of Nice ”), Museum of Natural History, Musée Massena, Naval Museum and Galerie des Ponchettes. Being a vacation resort, Nice hosts many festivals throughout the year. 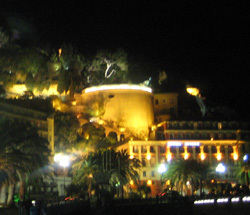 For example, Carnaval de Nice and Nice Jazz Festival are among the festivals held in Nice. 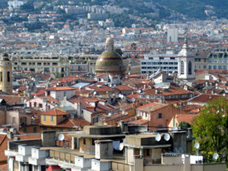 Nice has a distinct culture due to its unique history. The local language NiÃ§ard (Nissart) is an Occitan dialect (but some Italian scholars argue that it is a Ligurian dialect), still spoken by a huge minority. Strong Italian and (less) Corsican influences make it more intelligible than other non-extinct Provencal dialects. In the past, Nice welcomed many immigrants from Italy (who continue to make a large proportion of the population), as well as Spanish and Portuguese immigrants. However, in the past few decades immigration has been opened to include immigrants from all over the world, particularly those from former Northern and Western African colonies, as well as southeastern Asia. Traditions are still alive, especially in folk music and dances. The most famous is farandole. 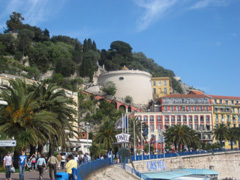 Take a walking tour of Nice -- Gayot.com has an excellent online guide to a 3 day tour of Nice.